Bartender Sam Chase prepares Tree Spirits absinthe at Nocturnem. Preparing absinthe, a bright green liquor made with a mixture of herbs, is a process worthy of its artistic bohemian roots. Absinthe gained notoriety in late 19th- and early 20th-century France, where the drink was popular among Parisian artists and writers like Vincent van Gogh and Marcel Proust. 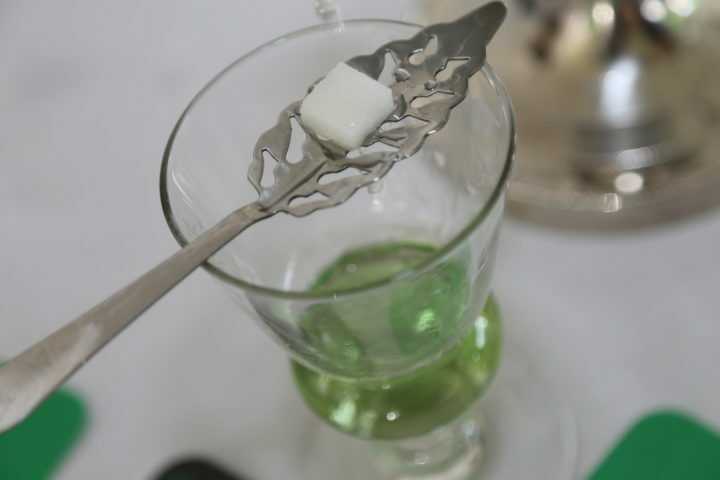 The traditional “la louche” method of preparing absinthe starts with about an ounce of the bright green liquor in a glass topped with a latticed metal spoon that holds a sugar cube. The sugar cube is slowly dissolved in water — which, at Nocturnem Draft Haus in Bangor, is dripped from an antique pewter fountain that owner Gene Beck bought on eBay — until the spirit is thinned into a hazy green cocktail. The process sweetens the bitter edge and waters down the 130 proof liquor into a smooth, licorice-flavored tipple. Maine’s most popular liquor, Fireball, as a point of comparison, is 66 proof. “It’s not the way you saw in ‘Moulin Rouge,’” Beck said with a laugh. In the 2001 Baz Luhrmann film, a group of French bohemians take shots of absinthe topped with flaming sugar cubes as Australian pop star Kylie Minogue emerges in the form of a glittering green fairy. Tree Spirits absinthe prepared traditionally with a spoon, sugar cube and ice water. Even so, the preparation process does have a cinematic quality. The bottle of absinthe being used in the preparation was from Tree Spirits Winery and Distillery, which has a holographic green fairy on the label. Tree Spirits absinthe is special in a different way: it is the only Maine-made absinthe. Olson “fooled around” making his own wine and brandy for years before starting his Oakland-based winery and distilling business in 2010. A few years later, he started experimenting with absinthe. It was nearly 40 years after he had first read about absinthe in a novel he read for his freshman writing composition class at Colby College in Waterville. To make absinthe, Olson starts out with apple brandy, specially distilled at a higher proof, as a base liquor. He distills it and adds the first three herbs — anise, fennel and wormwood — and lets the mixture sit in the still overnight. He then takes part of the mixture and infuses it with the other herbs: lemon balm, hyssop, coriander and petit wormwood. Most of the raw ingredients for Olson’s absinthe are also grown in Maine. Olson makes the base liquor apple brandy by distilling wine made from fermented apple cider that he purchases from Apple Farm in Fairfield. Most of his herbs come from Blessed Maine Herb Farm in Athens; the only herbs he cannot get from there are anise and fennel, which Olson said he buys from an organic farm in Oregon. 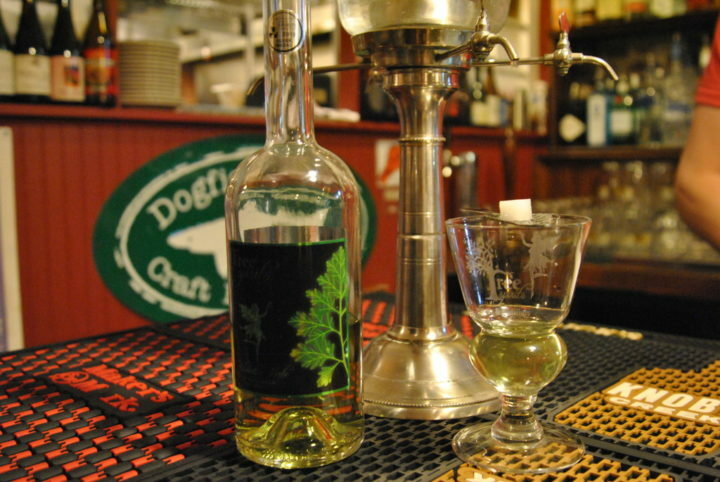 The market may be a hurdle for other potential absinthe producers in Maine. Olson said that while the bottles of absinthe, which cost $77 for 750 milliliters, make up a large share of his annual profits because of their cost, he does not sell that many bottles every year. Olson said absinthe attracts a small population of curious buyers who are attracted to unique spirits, mostly millennials and older liquor enthusiasts with money to spend. The legal hurdles could also deter potential producers. While absinthe has been legal in the United States since 2007, the liquor is still heavily regulated because of its tenuous ties to hallucinogenic properties. Olson explained that to introduce a new wine or spirit, producers are only required to submit a formula to the federal government for approval. 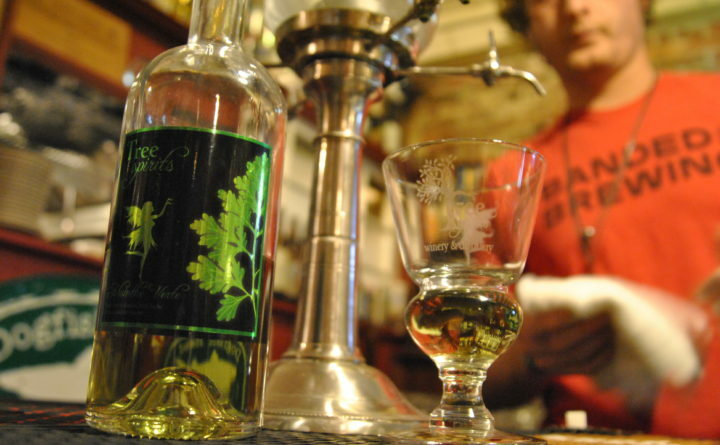 With absinthe, producers have to send in a sample and they test it for thujone, the hallucinogenic found in wormwood; the Food and Drug Administration’s legal limit is 10 parts per million of thujone. Still, absinthe stockists are hopeful about the future about the future of the spirit in the Pine Tree State. The set-up for "la louche" method of preparing absinthe at Nocturnem. Beck said that Nocturnem has been serving absinthe for over six years. They began serving Tree Spirits about four years ago after Beck encountered the distillery on a trip to Skowhegan with the Growler Bus, a Bangor-based distillery and brewery tour company which Beck also founded. Beck admitted that Nocturnem’s customers only order absinthe every so often, but when one orders absinthe prepared using the “la louche” method, it is likely to inspire a curious chain reaction. Besides serving the absinthe in the traditional manner, Nocturnem serves three cocktails with absinthe. One, called the Root of All Evil, is made from absinthe and Maine Root root beer, and is available year round. The other two — Corpse Reviver and Death in the Afternoon — are seasonal Mardi Gras cocktails that are available until Fat Tuesday on March 5. Correction: An earlier version of this report misstated the name of Nocturnem’s absinthe and root beer cocktail.